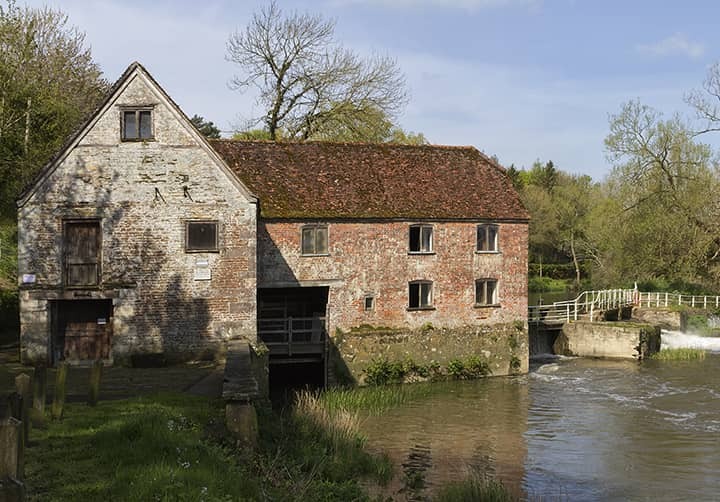 Sturminster Newton Mill is one of a series of ancient flour mills built on the River Stour. It is thought that there may have been a mill on this site in Saxon times and there is evidence that a mill existed in 1016. 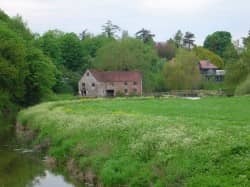 The Mill is recorded in the Domesday Book of 1086 where four mills in the Sturminster area are mentioned. 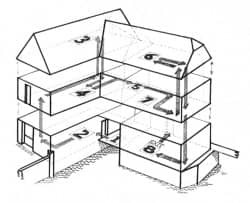 The present L-shaped building consists of the south and north wings. The south wing, which sits firmly on the river bank, was last rebuilt c.1650 on a centuries-old site. The north wing, which juts out into the river, was originally a completely separate fulling mill built in 1611. It was demolished in the late 18th century and rebuilt in brick on its original stone base to join with and extend the grain mill. 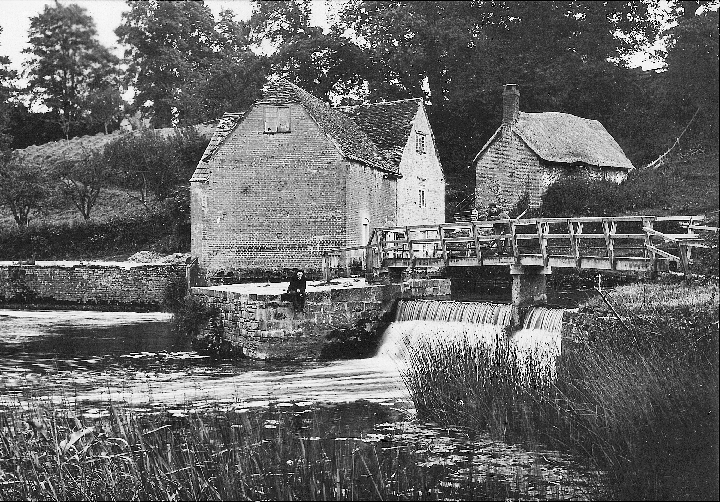 Until the turn of the 20th century, Sturminster Newton Mill was powered by a pair of undershot water wheels working side by side which drove four sets of stones. 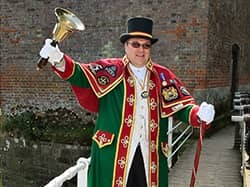 The last pair of water wheels, fitted by William Munden of Ringwood in 1849, were capable of a combined output of 12 horsepower. In 1904 the mill was upgraded, and the two water wheels were replaced with a single water turbine. 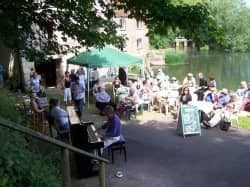 In 2016 we celebrated 1,000 years of milling at this site on the Stour and there’s a specially commissioned timeline, covering the whole period, on display at the Mill. This is a fully working water mill and a wonderful piece of industrial archaeology. The machinery runs every day the Mill is open and every second weekend in the month we produce flour that we sell in the shops in the Museum and the Mill. Our shop at the Mill also sells hot and cold drinks, local souvenirs, gifts and toys. On certain weekends we hold additional events and put on special displays (Please see ‘event information’ using the side button). Our knowledgable Mill Supervisors provide informal guided tours. As you go round, they will explain the full process of producing stone-ground flour and will be happy to answer any questions you have on this and the history of the Mill. However, if you prefer to wander round on your own, you are very welcome to do so. Wheelchair users are made welcome free of charge, but please note that wheelchair access is available to the ground floor only. Visits by groups are welcome. 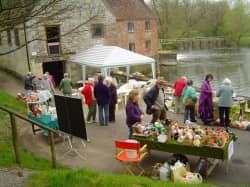 These can also be arranged to take place outside normal opening hours, by prior arrangement with the Mill Supervisors and benefit from reduced price entry. 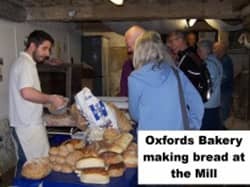 Oxfords Bakery baking bread at the Mill. The Mill viewed from the town bridge. 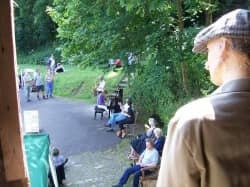 A fair held at the Mill. 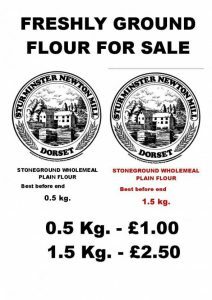 For Sturminster Newton Museum or Mill contact information, please visit the contact information page.